I’m a bit under the weather at the moment, but I wanted to show you a sneak peak of a bento my mother made (she’s visiting here for a month). It’s very classic, very Japanese - but made with ingredients that are pretty easy to get here. 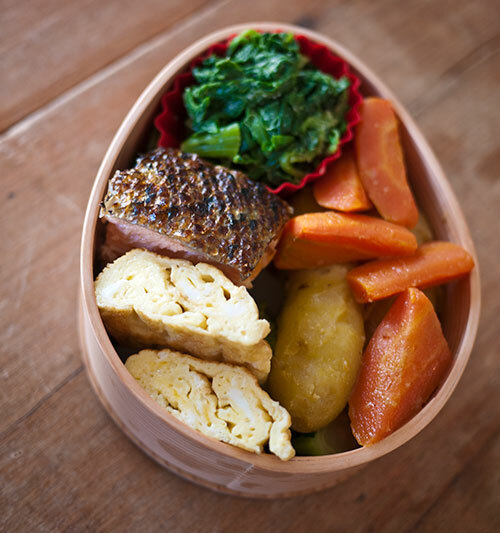 …and in the other compartment is some more of the stewed carrot, potato and onion that featured in the previous bento (recipe is now here), plus a piece of griled salted salmon, some blanched spinach, this time with a bit of soy sauce and dashi, and tamagoyaki. Basically all the parts are from bento stash. The rice was that vegetable mix mixed into defrosted premade rice; the spinach was from a batch that was blanched and squeezed out all at once; the salted salmon was premade and stored cut into pieces in the freezer; and my mother made a big batch of the stewed vegetables that lasted us for a couple of bentos and a few dinners too. The only thing made from scratch so to speak was the tamagoyaki. But it all tasted wonderfully fresh, and pretty healthy too (maybe a bit heavy on the carbs, which can be adjusted). In other words, a classic everyday Japanese bento. I love the presentation of this bento! The bento box is gorgeous, and I can't wait for the veggie-mix recipe. Really love this one! But if you put them into a wood material bento box, are you going to warm it up while you eat or just eat directly? 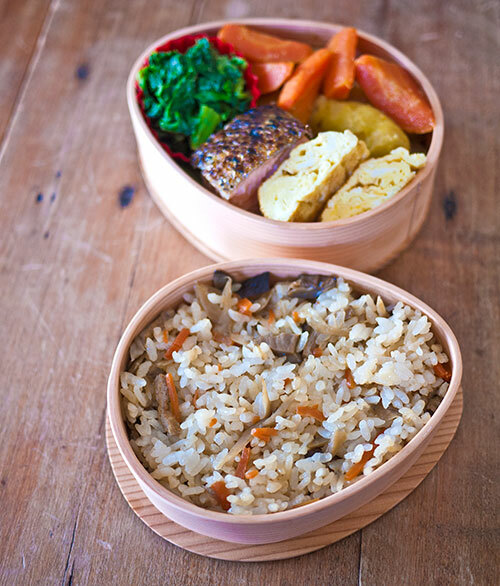 What is the purpose to use wood material bento box if this meal is winter mixed classic, but wood bento box can not keep warm? That looks so yummy! I cant wait for the recipes! Is that a spill proof bamboo bento? Fri, 2013-03-22 01:53 by anon. This all looks so good ! Looks absolutely delicious. I've really enjoyed making Japanese food. Thanks. I love Haiga-mai rice and its the rice I usually always buy when I need short-grain 'sticky' rice. 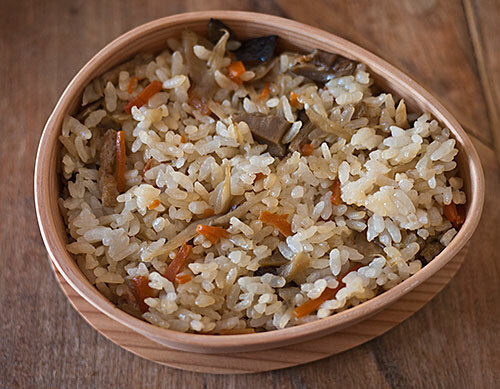 Do you still prepare haiga-mai rice the same way as you showed in the 'how to prepare the perfect white rice' post or is it different? Yes, haiga-mai is basically the same as white rice but with the wheat germ intact, so it can be prepared just like white rice. What brand of haiga mai you use and where do you get it in France? I don't actually use a lot of haiga-mai..the one I used here is a bag my mother sent me from Japan (sorry I know, cheating!) Most of the time I just use white rice, which cooks up the same as haiga-mai, or brown rice (genmai). I think the last haiga-mai I actually bought was Nishiki brand (grown in the U.S.), from Uchitomi in Geneve. For Japanese-style brown or white rice, I usually get Yumenishiki (which is grown in Italy) from Japancentre.com. Yumenishiki is excellent, so I don't see any reason why they wouldn't make a haiga-mai available if there is a demand for it. As a less expensive substitute for when the flavor of the rice is not that critical, e.g. for curry, we often use Toureau Rond rice which is grown in the Camargue and sold in supermarkets here in Provence (although it's only available as white polished rice I think). It cooks up just fine Japanese-style after rinsing and so on. such a pretty and colorful bento! simple, traditional and appealing foods, done well (could that salmon skin be any more perfect?!). i love seeing you healthy and so active on your websites again, sharing such amazing information with us (am really enjoying the japanese cooking series). this box is super cute too... have never seen this subtle egg shape before! Fri, 2013-04-12 11:29 by Hana. I love the egg-shaped bento box! where is it from?